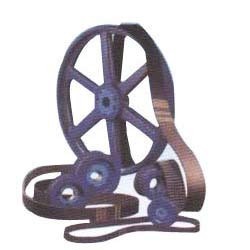 With the aid of vast knowledge and expertise, we offer a unique quality of Timing Pulley. The offered product is developed using finest quality raw material in compliance with the international quality standards. Further, our offered pulleys quality tests to ensure a fault free product to our client’s end. With a main aim to accomplish high level of patron trust, we have been engrossed in providing a vast assortment of Timing Pulley. Minimum O.D. to be Cut : 15mm Maximum O.D. to be Cut : 800mm Hub Cutters available are HTD, XL, H, L, X. Pitch from 2.5mm to 25mm & from 1/5" to 7/8". (Flat or Round type belt). Timming Pulley are cut on Hobbing Machine (Generating Process) of any number of Teeth. 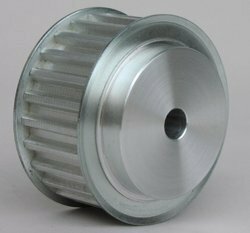 Materials Generally used for Timming Pulley are Aluminum, Nylon, Hylam fabric base, Alloy Steel, C.I. etc. as per requirements. We are instrumental in offering Timing Pulley to our clients. These pulleys are used in several machines and automated conveying systems for their attributes like corrosion resistance, fine finish and easy installation.